Snickerdoodles are one of my favorite cookies. They’re an old fashioned cookie that has been around for years. Last Christmas I went over to my sister-in-law’s house for a huge baking day. We baked about five different recipes and the easy snickerdoodle cookies were the family’s favorites from the day. Snickerdoodles contain cream of tartar. This ingredient gives them a slightly tangy flavor and makes them soft and chewy. 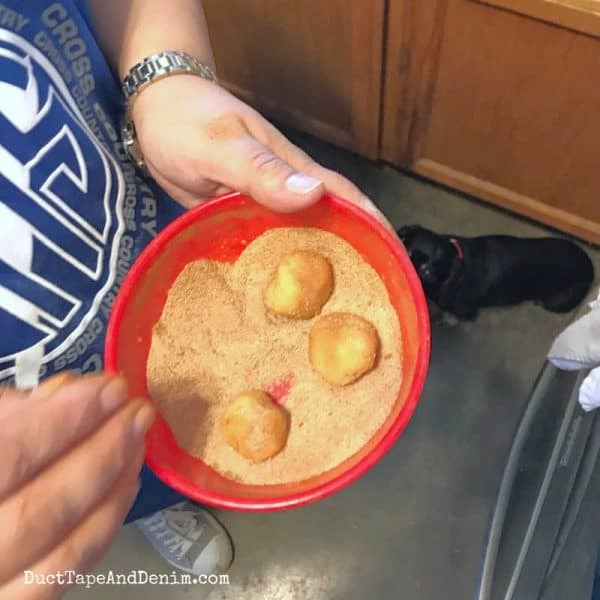 Snickerdoodles are rolled in a cinnamon and sugar mixture. Sugar cookies are usually cut out. Sign up for my Family Recipes email list & have all my EASY recipes sent straight to your inbox! I make my cookies “backward” from most recipes. First, I cream the shortening or butter and sugar. Add eggs one at a time, mixing well after each one. Beat in vanilla. Then, instead of mixing the dry ingredients separately and adding them, I’ll mix in the cream of tartar, baking soda, and salt before adding the flour, 1 cup at a time. Just be careful not to overmix. If the dough is soft, stick it into the fridge for 30 minutes to 2 hours. Mix the sugar and cinnamon in a bowl. 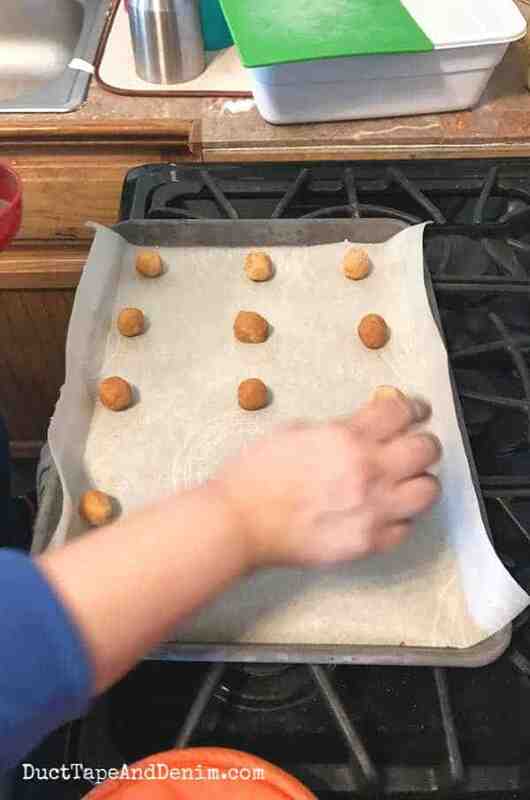 Use a cookie scoop to make a ball, roll it in your hands, and drop into the cinnamon/sugar mixture. Roll it around until the ball is completely covered in cinnamon and sugar. This is the best part to me! Bake at 375 F for 8-10 minutes. Let cool for about 5 minutes before moving to a cooling rack. When they’re completely cool (if any make it that long), store in an airtight container. They can also be frozen! I often make these (and many other cookies) in October and November. Then when it’s time to put together plates of cookies to give to our friends and neighbors, I just pull them out of the freezer. 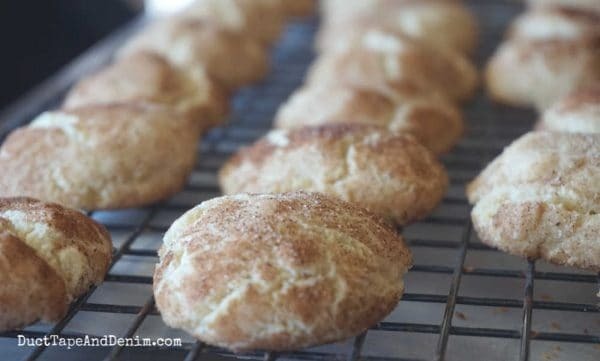 The perfect snickerdoodle cookie is slightly crunchy on the outside but still soft and chewy inside. Wow… I’m getting hungry just writing this. I may have to stop and bake some cookies! All of these can also be frozen — either as dough balls or as finished cookies. My kids always liked it when I froze them as dough balls. That way they got freshly baked cookies EVERY time they ate them. 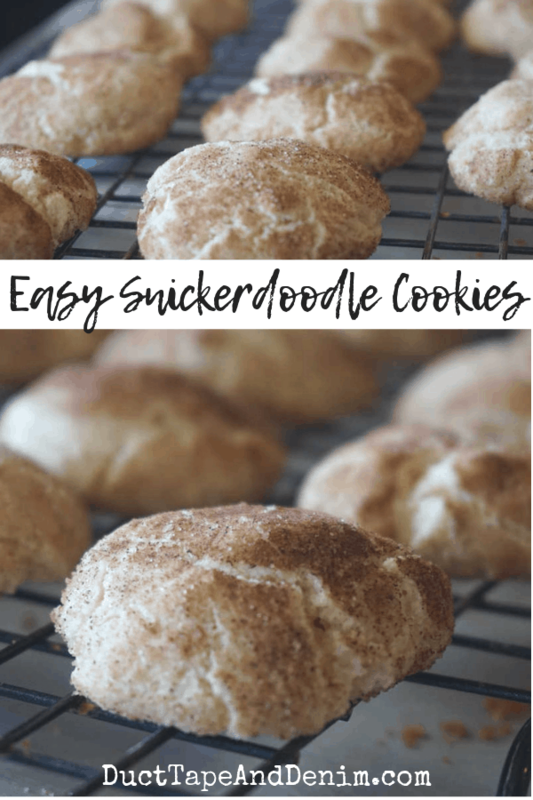 Hope you enjoy these delicious and easy snickerdoodle cookies! Leave a comment and let me know if you have a favorite cookie recipe!